Keen to travel the world using his own means of transportation, Michael Wissinger asked premium custom builder Bischoff+Scheck to build him a vehicle which would use Mastervolt’s autonomous power products for the onboard energy consumption. 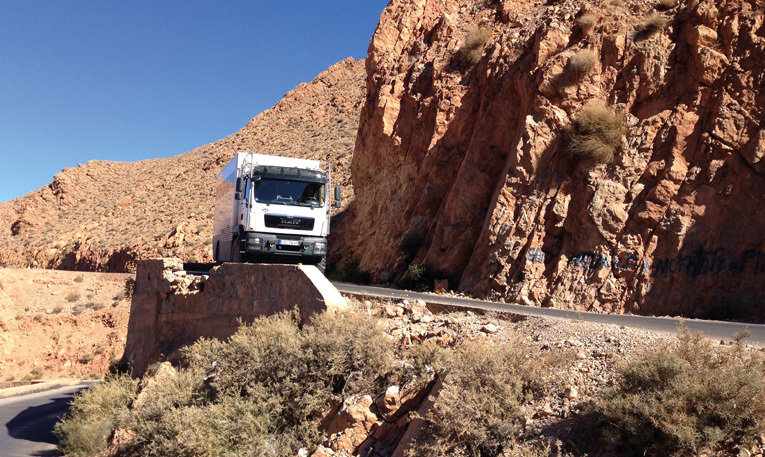 The resulting truck combines the ruggedness required to drive in all road conditions with the home-from-home comforts needed to enjoy travelling for up to a year. Long periods of electrical autonomy are critical to such a high degree of comfort, especially when travelling to places where grid connections are rarely available. Powers all onboard (DC and AC) appliances fully autonomously on batteries. Is able to charge the batteries from the truck’s engine while driving as well as via solar power. Offers autonomy of up to one week of sunny days, without driving (and thus charging the batteries) in between. The requirement for this vehicle is to have autonomy for one week of sunny days. With an average daily onboard energy consumption of 5 kWh and about 3 kWh of solar energy generation on a sunny day, this means that 7 times 5 – 3 = 2 kWh, or 14 kWh is required. This can be achieved by using three MLI Ultra 24/5000 batteries bringing a total capacity of 15 kWh. With Lithium Ion batteries the actual capacity can be almost fully (80 %) used on every discharge cycle without compromising cycle life, which is why there is no need to install surplus capacity. On completely cloudy days, the same set will deliver autonomous power for almost three days without having to run the engine. Almost all major appliances onboard are AC appliances, requiring the use of an inverter. 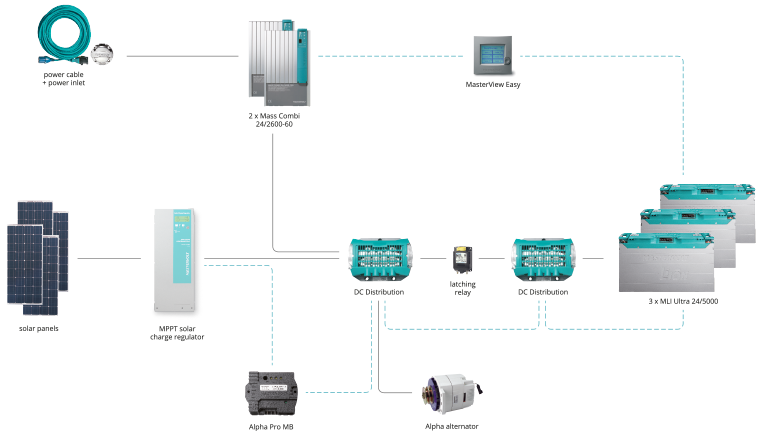 To supply a combination of loads simultaneously the choice was made to install two Mass Combi 24/2600-60s with a combined inverter output of 5000 W. Using a combined inverter/charger product automatically added the functionality of charging on a plug. The two main energy sources are an alternator on the truck’s engine and four solar panels on the roof. To properly charge the Lithium Ion battery, an Alpha Pro MB charge regulator is used for the alternator. Mastervolt did not have the MPPT solar charge regulators it currently has in its portfolio at the time this vehicle was built – these would now be the choice for connecting the solar panels as well. 3 x MLI Ultra 24/5000 Lithium Ion battery. 2 x Mass Combi 24/2600-60. 2 x DC Distribution 500. 1 x latching relay 500 A. 1 x Alpha Pro MB charge regulator. 1 x Alpha 24/150 MB alternator. 1 x MasterView Easy remote control. 1 x power cable 16 A. 1 x power inlet 16A/230V.